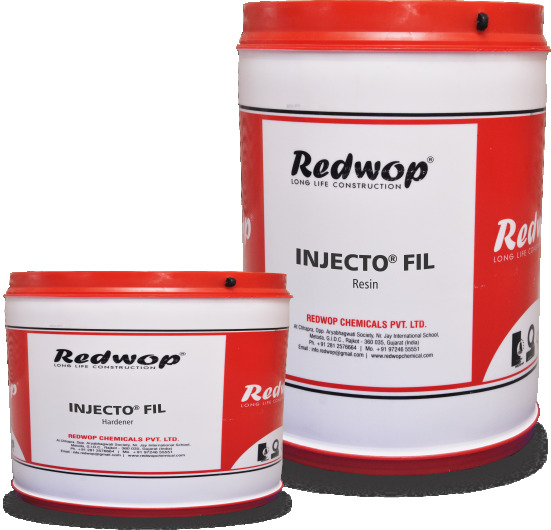 Low viscous epoxy injection grout Uses: INJECTOFIL is used for injecting into cracks, honeycombs and cavities in concrete structures. It can also be used for grouting base plates with very narrow gaps (<10mm). Advantages •	Low viscosity - Can be injected into fine cavities and narrow gaps. •	High mechanical strength - Performs even under heavy loads and stresses. •	Excellent adhesive strength - Good bonding with substrate •	Two part system - Easy to mix and handle •	Non shrink - Complete filling of voids and cracks •	Chemical resistant - Can be used in aggressive environments.